Like everyone I have my share of computer problems. After trying to deal with numerous problems, I decided to restore my wife’s laptop back to factory settings and start from scratch. Like many of my readers the first thing I do is to download and install WinPatrol. 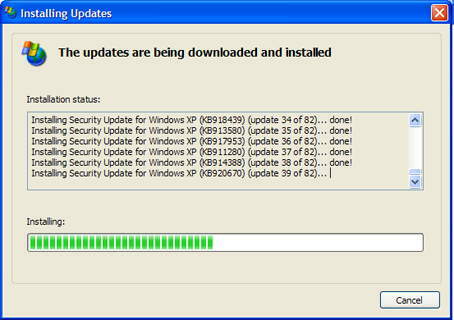 The next very first step is to re-install all the Windows security updates that have occurred. This was no minor task. There have apparently been 82 various updates since we received this machine over a year ago. 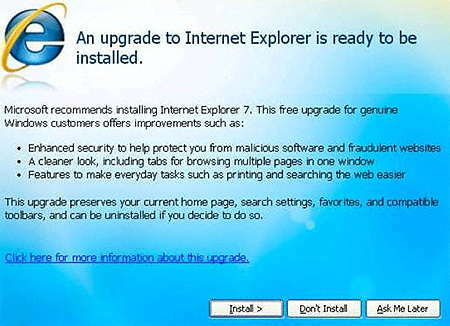 I was very happy that before updating Internet Explorer to IE7 it actually asked permission. For now I’m still sticking with IE 6 especially so it doesn’t confuse Cindi. · One Microsoft Security Bulletins affecting Microsoft Office with a Maximum Severity rating of Critical. These updates will not require a restart and will be detectable using the Microsoft Baseline Security Analyzer. · One Microsoft Security Bulletin affecting Microsoft Office and Microsoft Windows a Maximum Severity rating of Critical. This update will require a restart and will be detectable using the Microsoft Baseline Security Analyzer. · One Microsoft Security Bulletin affecting Microsoft Virtual PC and Microsoft Virtual Server with a Maximum Severity rating of Important. This update will require a restart and will be detectable using the Microsoft Baseline Security Analyzer and the Enterprise Scan Tool. I'll be downloading the new updates on Tuesday but I'll be waiting a week before installing them. These are pretty big changes and if history repeats itself, there will be some quirks for some users. If you do experience problems, there is a toll-free number that Microsoft has setup for security patch problems. It’s 1–866–PC-Safety. I came across your blog while doing a search and I noticed that you use jpeg screenshots. Could you use png instead, pretty please? It won't leave those nasty artifacts and it compresses computer screenshots to smaller size than jpeg, so it saves bandwidth as well. PNG isn't so good at compressing photos, so you should stick to jpeg for those.